Disclaimer: Chris Carter and 1013's. I open my eyes. 'Here' is a diner. "I thought we were eating somewhere respectable tonight." "We're in the middle of nowhere. What's good enough for a trucker is good enough for me." Mulder looks at me expectantly. "Come on, Scully, you've got to eat sometime." I eye the diner again. There is a neon sign in the window blinking 'Open' at us and the roof sags in the middle. The exterior walls are graying, the paint peeling off - probably from years of abuse from the harsh desert winds. The parking lot has several 18-wheelers parked in front and the gas pumps look tired. I note the lack of 'pay at the pump' technology. "I said I'd follow you anywhere, Mulder, but there are limits." He just grins at me as he turns off the SUV and opens the door. I sigh and follow him. The evening is pleasant enough and I breathe the fresh air in deeply. After hours in the musty vehicle, it's so good to inhale something that doesn't smell of popcorn and Cheetos. Mulder's sneakers crunch on the gravel and then he stops, waiting for me. "It looks like a well-trafficked truck stop. They probably have showers in the back," he says. "What do you say, Scully?" I scowl. "Don't even think about it." His look tells me that he's most definitely thinking about it. I ignore him and pull the door open. Inside, the decor is blue Formica and silver accents. A small cardboard sign nailed to the wall indicates that the bathrooms and showers are in the back, beyond the kitchen. A waitress indicates a booth and I slide in. The menus are dropped carelessly in front of us and the waitress grunts something about bringing us silverware. Mulder sits opposite me. I note the wrinkles at the edges of his eyes, wonder why I never noticed them before. "How are you doing?" I ask Mulder. Sometimes, he worries me, the way he pushes, the way he keeps going, not knowing when - or even *how* - to stop. "You drove a lot today. Twelve hours. That's a long time. We should take breaks more often." "I'm fine." He glances out the window, at the white SUV that's become our home away from home. I think about the pile of dirty laundry in the back, the discarded soda cans, empty boxes of crackers and Harlequin romance novels - all these things which litter the SUV and which I can't bring myself to clean. "I'm thinking about tomorrow." "We should reach Portland by mid-afternoon." "You sure you don't want to take it easy? There's no reason to drive all night." Mulder looks back at me. "I want to be in Oregon tomorrow." "What begins?" I can't help the frustration I feel when talking to Mulder these days. These cryptic statements of his, the ones he makes to supposedly protect me, to keep from killing my spirit. Sometimes I want to tell him that it's not my spirit I'm worried about, but his. "Mulder, you're not making any sense." He gets up abruptly. "I'm going to take a shower. Order for me." "I need a shower. Order for me." "What do you want?" I swallow my annoyance. It's not worth arguing with Mulder, not now, not here. He's nothing if not stubborn. "That." He jabs a finger at the menu; I don't think he's even read it. "Great, Mulder. That's a heart attack on a plate." By now, he's already heading to the showers. I cover my face with my hands. "Please. For Mu- him too, please." Kelly produces two mugs and fills them with her coffee pot. "You folks just passing through?" "I've never been there." I look at Kelly. She's in her teens, I'm sure. Her face is round, freckled and her hair is a deep auburn - the color my hair used to be. She wipes her hands on her pants. "You been there before?" "Yes." A full circle, I think. I followed Mulder to Oregon on our first case together and then again when he was taken. And now he says we have to go back there. "A few times." "Are you going there for vacation? Family?" Kelly asks. "Ah." She whips out her notepad. "Ready to order?" "Yes. I'll have the fruit plate and Mul- he'll have the Great American hamburger with fries." I look out the window at our SUV. The car is streaked with mud, thanks to the rainstorms of the past few days. Today is the first day we've seen the sun and for that, I've been grateful. The endless gray skies, the endless horizons, the driving to nowhere - all of it has managed to turn me in to someone I'm not particularly proud of. I hold on because Mulder needs me because we can't both be weak and I'm afraid for him, afraid as I've never been before. I've always believed in him, in what he believes, but these days, I can't help but wonder where this quest is taking him - taking us. "You want fries?" she persists. "I just want the fruit." Kelly looks at me uncertainly. "Your man, he said to make sure you ate something substantial." "My *man* - " I stifle a smile - "doesn't dictate what I eat. I want the fruit." Kelly still isn't convinced. I'm sure she's worried about her tip. "Don't worry about him," I say softly. "He's got a lot on his mind and he like to think about things that aren't important. It helps him cope." I look up at Kelly. "You really think so?" "Tired too," she says. She leans against the table. "I hope you don't mind me saying so." I twist my fingers together. "No," I say finally, "I don't mind you saying so." "Maybe when you get to Oregon, you'll get some rest." I find it highly unlikely that we will stop when we get to Oregon. There is something there, something that drives Mulder relentlessly. And after Oregon, we'll go somewhere else. We will keep going until it all ends. There won't be a house or a picket fence at the end of the road we're following. There won't be a dog or even two cars in the driveway. None of that is for us; this much I have acknowledged, have accepted. "Won't you?" Kelly's eyes are wide, bright with curiosity. "I don't want any fries," I say quietly. Kelly gets the hint and returns to her spot behind the counter while I brood. It's been three weeks now. Three weeks on the road, three weeks of this endless landscape of America. We're driving into the sky, going to the very edges of the earth. And when we reach there, there will be nothing left for us to do but wait. The more I consider it, the more I believe it's not fear that worries Mulder, but the waiting. When we finally stop, it'll be one day after another, wondering if this is the last day on earth, is this our last moments? Logic dictates that we treasure these last moments - however long they may last. It is unknown whether the end will come slowly and painfully or quickly in a blaze of fire and despair. It is knowledge we have, but not knowledge we can share. It comes down to one bare fact; we cannot run forever so eventually we must stop, we must wait. Of course, this is all information that I can't tell Kelly. I can only imagine what she'll say to her fellow workers about us once we drive away. She will call us crazy, spooky, laugh perhaps as she describes us. And then, unlike us, on that last day, she will not be waiting. She will not realize when she's served her last plate of eggs with home fries and toast. She won't know that the last kiss was exactly that. Mulder stands over me. He looks refreshed, his hair standing on edge. His white shirt is unbuttoned at the collar. "Hi," I say. He slips into the seat in front of me. "Your heart attack on a plate is on its way." "I just got some fruit." Mulder looks out the window. "So we head north from here? Portland, right?" Small talk, I think, going over a conversation we've already had a million times. And suddenly I'm afraid of what will happen to us when we finally run out of words and when we're sitting in drab hotel room, in silence, waiting for the end of the world. "You're the driver," I tell him. "We're in this together, Scully." He looks at me seriously. "Aren't we?" I nod. At that moment, Kelly brings our food. I poke at the colorful assortment of fruit - strawberries, cantaloupe, honeydew and grapes. Mulder's plate is stacked high with home fries, bacon and eggs. "Home cookin'," he says, smacking his lips with relish. He eats eagerly and I try to remember when was the last time we stopped. I have a dim memory of a vending machine the night before, of Mulder kicking it and finally handing me a package of Fig Newtons. "Bon appetite, Scully," he had said. "Not for me, thanks," I say, covering the mouth of my mug with my hand. Mulder nods. "Thanks," he says. Kelly's hand shakes slightly as she pours the coffee. It spills over the edge of the cup, brown staining the white. "Sorry," she says. Mulder dismisses her comment with a wave of his hand. "Could happen to anyone," he says easily. He smiles at her - classic, trademark crooked Mulder grin. Kelly is charmed. I push what's left of my fruit away. "Have you worked here long?" Mulder asks. "Six months," Kelly says. She is cleaning up the mess and I notice that her fingers are long, elegant, capped with red nails. I fold my hands in my lap. "I'm saving to go to Hollywood. I want to be an actress." "That's a tough life," Mulder says. "Not a lot of people make it." "But my drama coach in high school says I have talent," Kelly says earnestly. She is looking only at Mulder now. "I've been to a couple of auditions already." She shrugs. "Nothing panned out. But it's only been six months." "How old are you?" Mulder asks. "Seventeen." Kelly shifts her position. "But it's just make-up, you know? I can be younger or older, anything you want." Mulder looks at her quizzically. Kelly blushes. "That's not what I meant," she says apologetically, flashing a look at me. I shrug. In the background, I can hear the sizzle of the grill, the aroma of fat threading through the air. "I know," Mulder says gently. "I figure, it'll take a few years for my big break," Kelly goes on. "Maybe by the time I'm twenty-five...?" I do a quick bit of mental arithmetic. As I glance at Mulder, I realize he's done the same. "Good luck," Mulder says. I know he means it. And I can tell by the expression on his face that he wants to tell her to speed her timeline up, that she shouldn't be in this little restaurant hundreds of miles away from LA. There isn't time, I can just imagine Mulder saying. There isn't time for you, for what you want to accomplish. Don't you understand? There is a conspiracy, a vast government conspiracy, an agreement made years ago, one that will rob us all of our dreams and desires for the future. But instead, Mulder's lips press together, tighten into a straight line. Kelly pauses awkwardly. "I'm not just gonna be a waitress forever, you know." She sounds a little desperate. "I do have talent. I'm not going to wait tables for the rest of my life. I'm going to be *someone*. It's just a matter of time. And I'm willing to wait, to do whatever it takes." Kelly's words rush together, as the blood warms my face. I see the black oil oozing across the deserts of Arizona and New Mexico. I see the Knowle Rohrs advancing, their limbs moving mechanically. There is fire. With every inch of me, I know there will be fire. I imagine acres of wasteland, of desolation, of lives destroyed. I visualize the famous Hollywood sign, its white letters singed, falling to the side. I see Kelly, pretty and pink, primping as the fire overtakes her. I get up, feeling sick to my stomach. "Scully?" Mulder is at my side. I push him away. "I need air." Outside, the temperature has dropped a few degrees. The wind whips through my hair, is bitter against my skin. "Scully?" 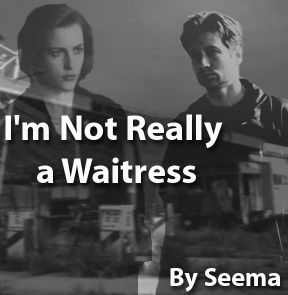 Mulder stands beside me, hands jammed into his jean pockets, his feet scuffing at the ground. "What's the matter?" "Let's go," I tell him urgently. "We have to make Portland by tomorrow." Mulder looks at me. "Are you feeling all right?" He yanks open the car door for me and I get in, buckling myself into the seat. The air is still heavy with the smell of popcorn. I swallow hard, praying I won't get carsick. As we drive away, I turn and see Kelly standing outside the diner. "I gave her a generous tip," Mulder says as he turns onto the highway. I look down at my chipped, battered fingernails. "She thought she did something wrong." He's eyeing me curiously. I shrug. "Good. She'll need all the help she can to get to Hollywood," I tell him. I reach over, take his right hand in mine. His skin is warm against mine. And I think, as the diner becomes a distant speck of the past horizon, this is how we're going to wait, Mulder and I, for the end of the world.